Jacky Utley is the source of yet another way to regale your members either at the reunion or in your newsletter (where I discovered Jacky). At www.placesnamed.com/default.asp you will find a site where you can type in a name (the name of your reunion, for example) and find some very interesting information about the name. For example, using my name, I discovered that Wagner is the 171st most frequent last name in the US. A long list of places called Wagner included information about the county, longitude, latitude and, in some cases, the elevation, area in acres and zip code. Bet your family doesn’t know those facts! The reported highlight of an evening program at a recent Eby Family Reunion in Prince Rupert, Canada, was The Eby Ear Wiggling Contest! 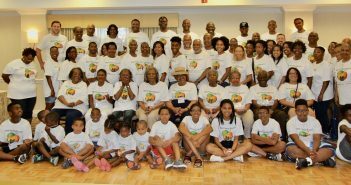 A Friday evening “Chew and Chat” welcomes arriving members of the Heath/Massey/Cunningham Family Reunion 35th reunion in Atlantic City, New Jersey, hosted by Philadelphia members. 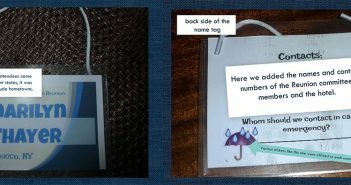 An anonymous e-mailer shared the following “ice” breaker which was successfully used to “loosen up” a family of Swedes. A spoon was put in the freezer then a string was tied to the spoon. Two teams of six people were picked. Each team member put the cold spoon through their clothing and each team was timed to the finish. Speed won. What to do to warm ‘em up? These four activities are intended to be enjoyed by family members of all ages. 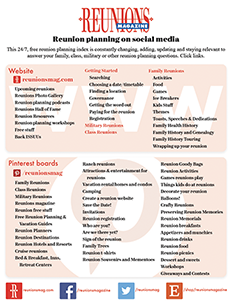 Very little equipment or supplies are needed but each requires some thought and planning before your reunion. You should be able to find things you’ll need around the house. Designatec”The Wish Bowl.” Ask everyone to write wishes for other family members and deposit them in the bowl. They can be wishes for the coming year or predictions like ones found in fortune cookies. On the paper, write the person’s name on one side, “My wish/prediction for you” on the inside and sign it. Read the wishes at a special ceremony. Bring the box to your reunion and when you’re together celebrating, open the shoe box and … remember. There are several fun balloon games you can play. How long can each person balance a balloon on their nose while walking or standing, facing the sky or ceiling? How many times can a balloon be punched before hitting the ground? Who kicks or throws it farthest? Try a balloon race. Mark start and finish lines. Start each race with a signal. First race – Carry the balloon on a plate. Second race – Kick the balloon. Third race – Hold a balloon between your legs. Cut paper into playing card size. The number of cards made is determined by the number of people playing. Write a number from one to ten and one action on each card. Examples: take 6 leaping steps; go back 4 steps; hold your left foot in your left hand and hop forward 2 steps. Next, decide on a start and finish line. Outdoor action could start at the bushes and end at the garage door. Indoor action could start at a living room chair and end at the refrigerator. Before you begin playing, choose an Action Captain to shuffle and hold cards. Take turns choosing and following the cards. The player who finishes first wins and is the Action Captain for the next game. Susan Thomas, Kansas City, Missouri, has a BA in Elementary Education from the University of Northern Iowa. She raised three children and taught primary grades for seven years. She teaches Writing for Children as a part time faculty member at Maple Woods Community College and in summer College for Kids.